The Spring really is a season for renewal, and it is the perfect time to switch skincare and makeup for lighter weight products and brighter colors. This is also the perfect time for a full reboot of what you have in your shower– from your shower head to all of the hair, skin and body products. In the spirit of fully embracing the season, I changed the shower head in our master bathroom and switched out most of our products. The following is my selection of refreshing, nourishing, and delectably scented products that now have pride of place in my shower. 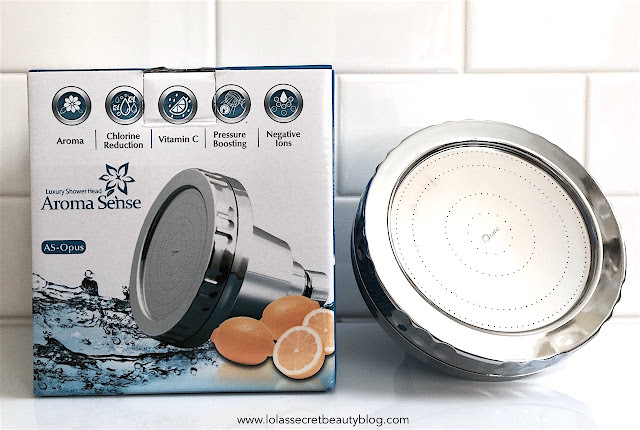 Aroma Sense AS-Opus Vitamin C Shower Head is the best thing to have happened to my shower in years! This ultra-easy to install shower head is hefty, well-made and very high quality. It has a powerful and strong jet spray that makes showering feel like a spa treatment! The relaxing aromatherapeutic shower experience, with its citrus scent, is an utterly delightful and refreshing way to begin the day. Designed to fit any standard shower arm, the Aroma Sense AS-Opus Vitamin C Shower Head can replace any mounted shower head fixture. With over 300 spray plate holes, this shower head is sure to provide the best spa-inspired experience, enticing you with refreshing and relaxing aromatherapy in your own shower. Our Vitamin C filtration technology can effectively neutralize chlorine to support healthy skin and hair, while its microfiber filtration removes additional contaminants brought through your piping system. 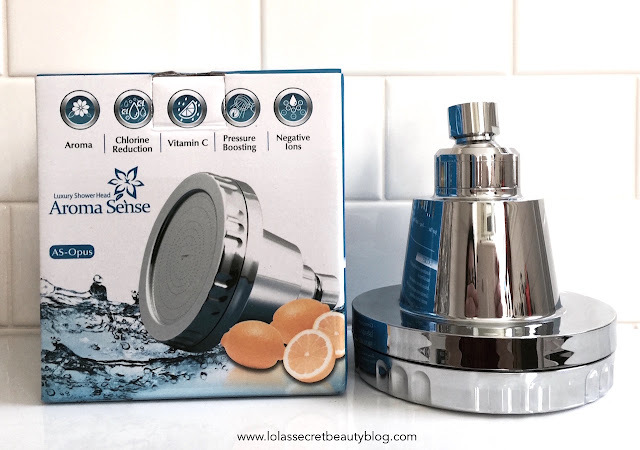 If you love spa jets, our laser cut spray plate that will boost weak water pressure to give you a therapeutic shower while using 25% less water than a branded shower faucet. Escape into paradise with this aromatherapy & vitamin c shower head to rejuvenate your mind and body! Key West Aloethera Moisturizing Shampoo is a great choice if you seek a shampoo that is gentle enough for everyday use. 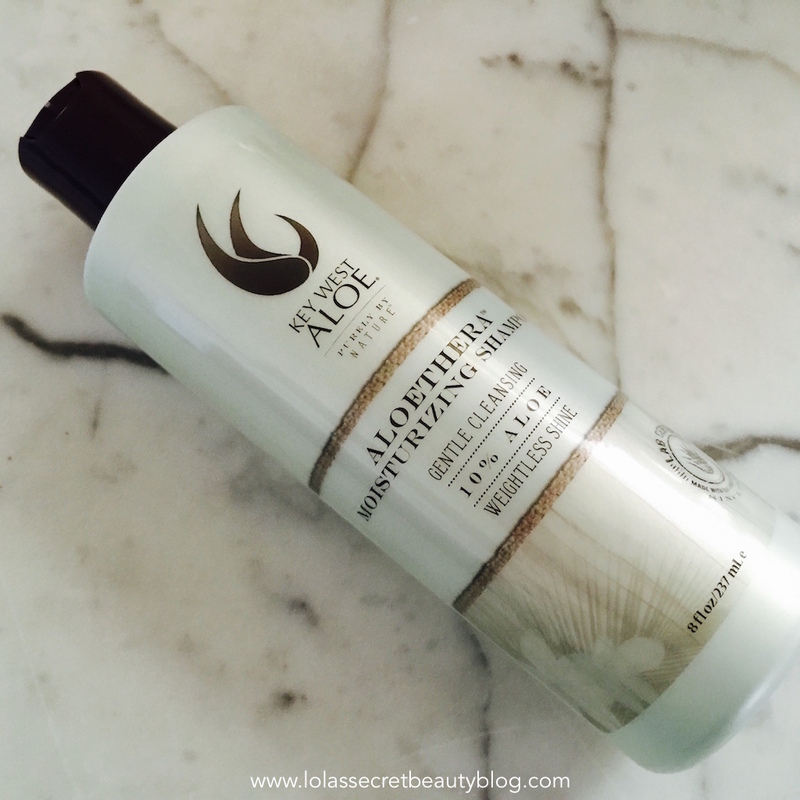 The formula is gentle, non-stripping, and offers enough moisture without weighing hair down. Ingredients: Water (Aqua), Ammonium Lauryl Sulfate, Cocoamidopropyl Betaine, Aloe Barbadensis Leaf, Extract, Polyquaternium­4, Sodium Chloride, Fragrance, Propylene Glycol, Tetrasodium EDTA, Caprylyl,Glycol, Methylisothiazolinone, FD&C Blue No. 1, FD&C Yellow No. 5. Key West Aloe Aloethera Keratin Conditioner is a fantastic choice if you need a conditioner that combats frizz, detangles, and moisturizes without weighing down your hair. It leaves my hair soft, silky and ultra manageable. Control frizz without adding weight with Aloethera Keratin Conditioner made with 10% Aloe Vera designed to hydrate, strengthen, protect, and smooth all hair types. Directions: Use After Each Shampoo. Allow To Remain On The Hair For 30-60 Seconds Prior To Rinsing. Ingredients: Water (Aqua), Aloe Barbadensis Leaf Extract, Cetyl Alcohol, Behentrimonium chloride, Cetearyl Alcohol, Ceteareth-20, Panthenol, Apple (Pyrus Malus) Extract, Papaya (Carica Papaya) Fruit Extract, Lime (Citrus Aurantifolia) Fruit Extract, Chamomile (Chamomilla Recrutita) Flower Extract, Glycerin, Fragrance, Carpylyl Glycol, Disodium EDTA, Methylisothiazolinone, FD&C Yellow No. 5, FD&C Blue No. 1. Key West Aloe Frangipani Bath & Shower Gel is a lathering shower gel that is hydrating and refreshing. The light floral fills the shower with its lovely essence, and it lifts the spirits as it gently cleanses the skin. It is also so gentle on the skin that it works beautifully for shaving. Let the scent of island flowers bloom while you cleanse, hydrate, and soften your skin with 30% Aloe Vera in Frangipani Bath and Shower Gel. Ingredients: Water, Aloe Barbadensis Leaf Extract, Sodium Lauryl Sulfate, Cocoamide DEA,Sodium Laureth Sulfate, Sodium Chloride, Fragrance, Citric Acid, Benzopheone­4, Disodium EDTA, Caprylyl Glycol, Methylisothiazolinone, FD&C Red No. 33, FD&C Yellow No 5. 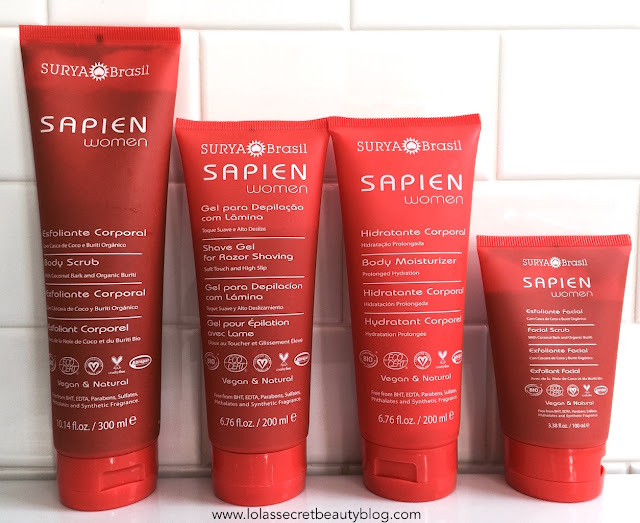 Surya Brasil Sapien Women Body Scrub is a highly effective, all natural, body scrub that efficiently, and thoroughly, sweeps away dead skin cells. The high concentration of Aloe Vera leaves skin soft, supple and unbelievably hydrated. The tropical scent is intoxicatingly beautiful, and it definitely creates a lovely sensory experience. Made with Amazonian Organic ingredients and 100% natural exfoliants from Coconut bark and organic Buriti, which remove dead cells and impurities. Amazonian White Clay* enhances the exfoliation power, and a high concentration of organic Aloe Vera juice provides intense hydration. Leaves the skin deliciously fragranced with the natural and tropical scent of coconut & mango with raspberry and vanilla. Free from BHT, EDTA, Parabens, Sulfates, Phthalates and Synthetic Fragrance. No GMO’s! 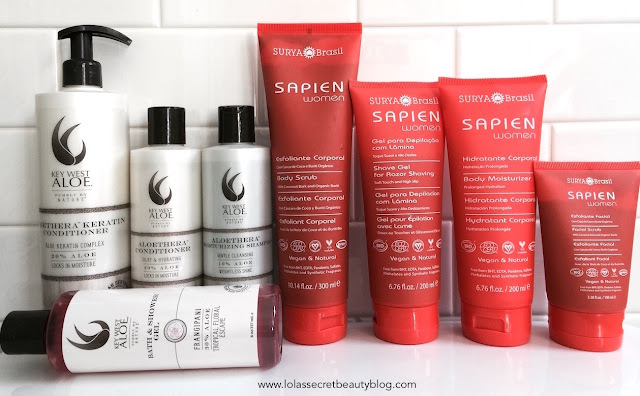 Surya Brasil Sapien Women Shave Gel is my current holy grail shaving gel. It is ultra hydrating, it has a delectable tropical scent, and it gives me the closest shave imaginable. It is gentle and nourishing, and such an amazing addition to my shower product line-up. The eco friendly Sapien Women Shave Gel protects your skin while shaving. Its a natural and vegan product made with exotic organic Amazonian ingredients like Cupuaçu butter, Pracaxi oil, Macadamia oil, Vitamin E to prevent drying and protect sensitive skin. Organic Aloe Vera juice and vegetable glycerin promote intense hydration.Contains a natural tropical scent of coconut & mango essential oils Zero GMO's! Free from BHT, EDTA, Parabens, Sulfates, Phthalates and Synthetic Fragrance. Promoting a smooth feeling to the skin, Pracaxi seed oil helps to hydrate and promote cellular renewal. As a powerful antiseptic it is often used in hospitals to cleanse skin after surgery and help in the prevention of stretch marks. In the Amazon region Pracaxi is the popular name of a tree, which grows wildly in wet tropical areas all around the northeastern part of South America into the Amazon forest. A natural cold press process of the seeds and flesh, using no solvent or any chemicals, obtains the oil. Ingredients: Water, Cocamidopropyl Betaine, *Aloe Barbadensis Leaf Juice, Decyl Polyglucoside, Glycerin, Disodium Cocoyl Glutamate, ** Sucrose Cocoate, Dehydroacetic Acid Benzyl Alcohol, Dehydroxanthan Gum, Fragrance, Xanthan Gum, Magnesium Aluminum Silicate, Citric Acid, *Penthaclethra Macroloba Seed Oil, Tocopherol, *Macadamia Integrifolia Seed Oil. *Theobroma Grandiflorum Seed Butter. Surya Brasil Sapien Women Body Moisturizer is a medium weight body cream that sinks in immediately– leaving skin exceedingly hydrated. It has a warm and earthy scent from which one detects chocolate, pineapple and something else that I can't quite identify. It smells good enough to eat, but after it sinks in the aroma begins to recede until it disappears altogether. 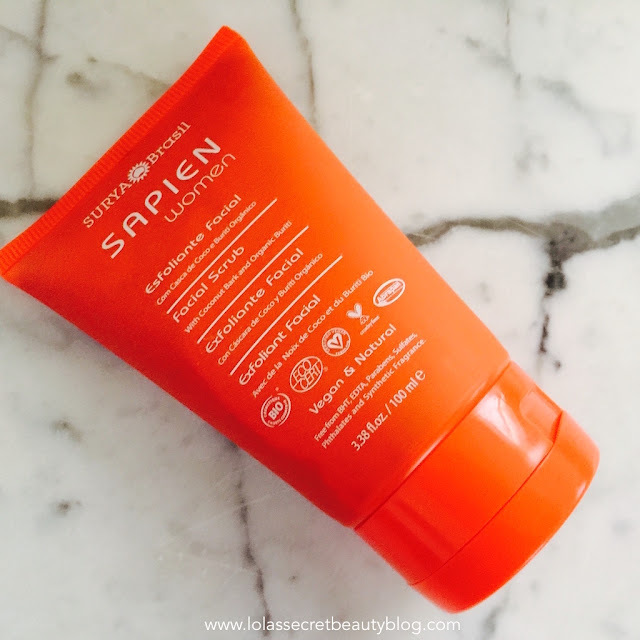 The eco-friendly Sapien Women Body Moisturizer is vegan, natural and rich in exotic organic Amazonian ingredients like Cupuaçu and Murumuru butters, Pracaxi and Açai oils, Amaranth protein, Vitamin E and Aloe Vera. Coconut & Mango Essential Oils. The white pulp of Cupuaçu is uniquely fragrant (described as a mix of chocolate and pineapple), and it is frequently used in desserts, juices and sweets. The juice tastes primarily like a pear, with a hint of banana. Cupuaçu is touted as a possible superfruit flavor. Commercial production of cupuaçu includes food supplements, pills, drinks, smoothies and sweets. The pulp is also used in cosmetics products such as body lotions, as it is highly hydrating, similarly to cocoa butter. 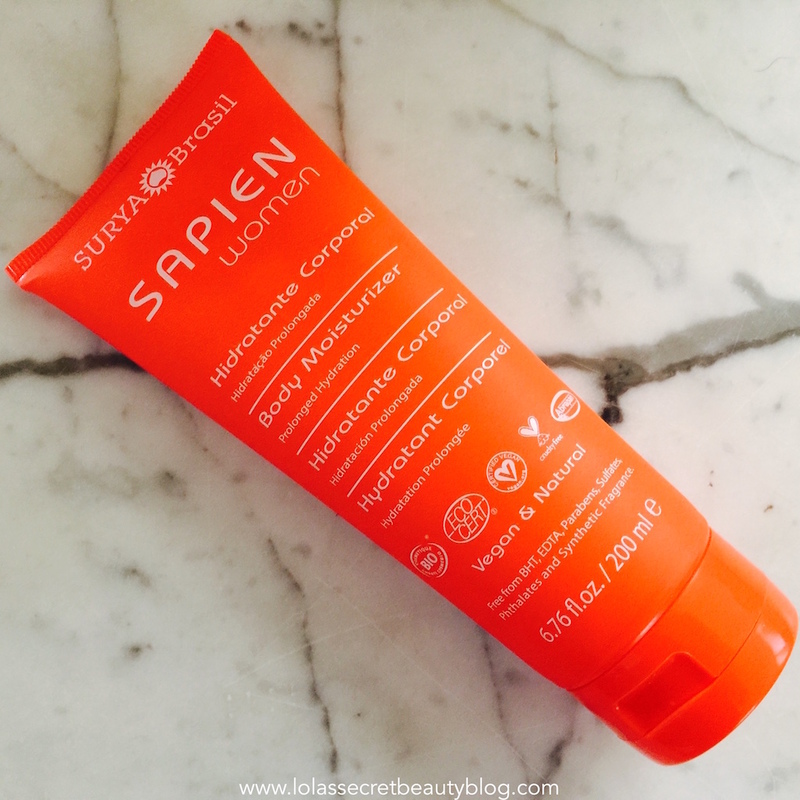 Free from BHT, EDTA, Parabens, Sulfates, Phthalates and Synthetic Fragrance and No GMO’s! Ingredients: Water, *Aloe Barbadensis Leaf Juice, Cetearyl Olivate Sorbitan Olivate, Glycerin, *Macadamia Integrifolia Seed Oil, Glyceryl Stearate, Dehydroacetic Acid Benzyl Alcohol, *Astrocaryum Murumuru Seed Butter, *Penthaclethra Macroloba Seed Oil, Fragrance, *Theobroma Grandiforum Seed Butter, Saccharomyces Silcon Ferment, Saccharomyces Magnesium Ferment, Saccharomyces Zinc Ferment, Saccharomyces Cooper Ferment, Saccharomyces Iron Ferment, Sodium PCA, *Euterpe Oleracea Fruit Oil, Xanthan Gum, Tocopherol, Sodium Hydroxide, Carrageenan. 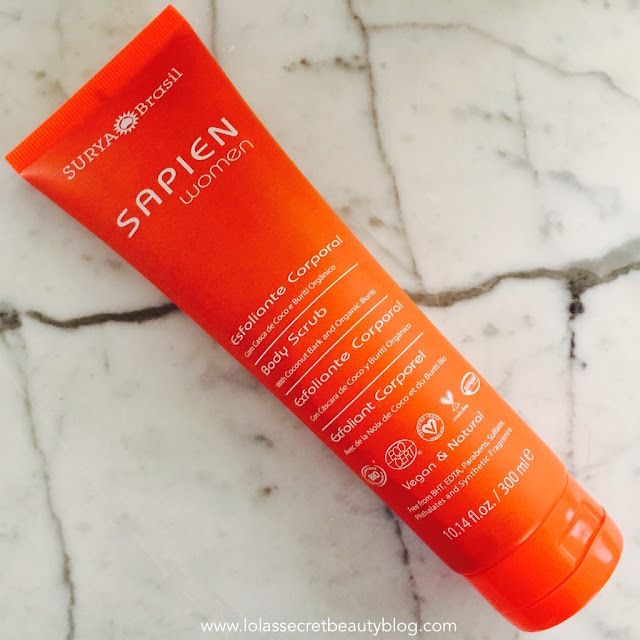 Surya Brasil Sapien Women Facial Scrub is a gentle, all natural, exfoliator that effectively removes dead skin cells while nourishing the skin. Skin is left soft, smooth, hydrated, and without any irritation. The tropical scent is refreshing and utterly delightful. Made with Amazonian Organic ingredients and 100% natural exfoliants from coconut bark and organic Buriti*, which removes dead cells and impurities. It leaves skin silky, smooth, soft and hydrated. No ethyl alcohol, sulfates or silicone. Ideal for all skin types. *Extracted from the fruit of a palm tree in the Brazilian Amazon, Buriti oil has the highest natural occurrence of pro-vitamin A available (carotenoids). The oil is also extremely rich in vitamin E (tocopherols); combined with antioxidants give it an incredible ability to moisturize and re-hydrate. The oil restores moisture lacking in sun-exposed skin and because of its color it possesses a naturally occurring SPF factor. 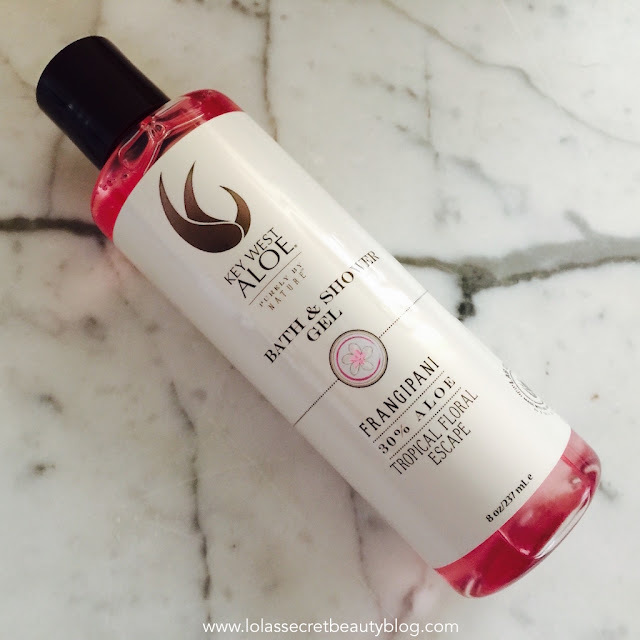 The rich unsaturated fatty acids in buriti oil help rebuild and hydrate new skin cells. Overall Assessment: I have been thoroughly enjoying greeting the day since my Springtime shower product reboot, and just couldn't be happier. Have you switched out any of the products in your shower in order to greet the Spring? Do tell! Press Samples. All views expressed are categorically my own. I'm starting to use lighter fragrances and more "spring"-like scents. It's the prefect time to transition to lighter fragrances! I didn't know a shower head like this even existed. Very cool! I do love tropical scents and will need to seek out that shaving gel. Sounds wonderful! Hi Stacie, Neither did I, but it is such a game changer! The shaving Gel is also scrumptious! I can't stop thinking about that shower head! What fun! It would be perfect for my color-treated hair since it removes chlorine and rust from the water. And the idea of aromatherapy in the shower sounds right up my alley! I broke open my Vitabath Spring Green for spring, but I continue to use my deep oriental scents year round because I love them so much. Hi Allison! It is the best shower head EVER!! I am hosting a giveaway for one– so please be sure to throw your hat in the ring! It should be up next week! I think that you would fall madly in love with it! I think that deep oriental scents are perfectly appropriate year round, and in fact I think anything the makes you happy is suitable whenever the spirit moves you! OMG. All of these products sound amazing, but I definitely need that shower head! They really are, and that shower head is especially amazing! That shower head sounds so awesome!! I've never heard of such a thing, but wow what a relaxing experience it must be! My blog partner loves that showerhead. I'm such a scaredy-cat when it comes to aromatherapy that she got all the fun of it. It's a truly remarkable shower head, Marcia! I certainly understand why Lisa loves hers! The scent isn't in the least bit overpowering– so no need to be a scaredy-cat! Everything sounds pretty great, but the body scrub scent definitely sounds like something I'd like in the shower. I definitely really love these products! The body scrub is definitely a huge hit with me! It really is, and it's definitely the perfect way to transform a typical shower into a wonderful spa experience! I completely agree with you, Courtney! That shower head has been on my list to try for a while now. Also, I think I need all of those Sapien products, especially the body scrub. The shower head is #amazing! The body scrub is really lovely and it smells absolutely delicious! Your posts are the best window shopping, ever in the history of blogs. I read here and always want #allofthethings. I would love that shower head and the frangipangi shower gel. Talk about a beautiful shower experience. WOW!!!! Thank you so much for your very, very kind words, Erika! It was a very long and exhausting week at work, and hearing that put a much-needed big smile on my face! The shower head is a true game changer, and the Frangipani Shower Gel is AWESOME!